Priests, Religious and lay people promote faith and mission alongside all things agricultural. Among the 1,400 exhibits of all things worldly and agricultural at this year’s National Ploughing Championships which drew more than 200,000 people, were stands promoting faith, religious education, mission and vocations. 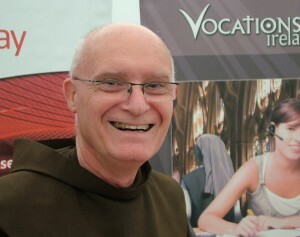 Brother Pat Lynch, a Franciscan friar, was at the Vocations Ireland stand. He said the response from people has been positive. Vocations Ireland is an umbrella body for all the religious organisations in Ireland. Nearby at a Missionary Union stand, Sisters from the Missionary Sisters Servants of the Holy Spirit were handing out leaflets with ‘A Farmer’s Prayer’ and brochures about their own work. Sr Eva Pliszizak, a young Polish nun, who entered the order aged nineteen, said the public were somewhat surprised to see the missionary sisters there. Young people talked to them about the bigger issues in life – “who they want to be, what they want to do with their lives. They are kind of searching for a purpose in life,” she said. And despite the small numbers of religious missionary Sisters, she was hopeful for the future. 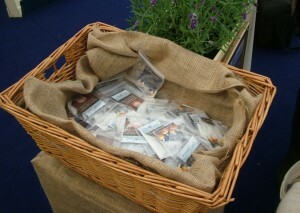 In the Diocese of Kildare and Loughlin tent, the novelty this year was small packets of blessed salt which were distributed to the public. The blessed salt proved to be popular among farmers. “I’ll sprinkle some of it on the land, on different parts of the fields, there in the next few days,” said farmer David O’Connor who has a 200 acre farm in Kilkenny. Reviving an old tradition: blessed salt for the land. The Kildare and Leighlin tent also had a prayer space where people could pray quietly. 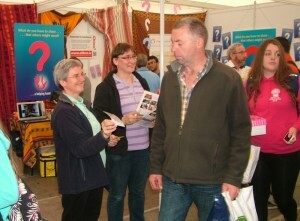 Fr John Cummins, Administrator at Carlow Cathedral, said people were glad to see a ‘church’ presence at the ploughing. “Some of them are just stunned actually to see us here,” he said. Other religious groups exhibiting at the Ploughing Championships this week were the Carmelite Monastery, the Jesuits, Sisters of St Joseph of Cluny, Legion of Mary. The Church of Ireland diocese of Ferns and Ossary, the Free Presbyterian church, Our Lady of Fatima rosary group and a Medjugorge group were also present.